Exactly 4 years ago, I reviewed Rick Stawski’s Fowl Dawgs 1, 2 and 3 DVDs. They covered both Basics and Transitions level training steps. Rick did an admirable job and captured over 8 hours showing actual dog training and how different things happen. 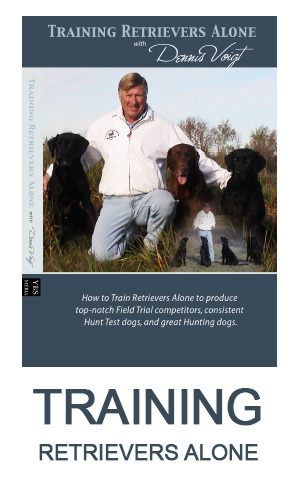 Rick is a successful field trial, hunt test and gun dog professional trainer in Minnesota. His background with Jim Kappes, Bruce and Wayne Curtis and others has resulted in Rick’s thorough program with obvious connections to the classic Rex Carr program. The Stawski Fowl Dawg DVD series remains one of the best bargains in the sport of working retrievers. Just recently, Rick added a 4th DVD and it’s a good one! This DVD shows some of Rick’s favourite field marking and handling drills, as well as some problem-solving sessions. Deciding on which of hundreds of setups to describe could be a challenge. I think Rick has made an excellent selection. When you think about the major problems that a competitive field trial dog might encounter, you could come up with a list such as: 1. Failure to mark a bird precisely, 2. Inadequate drive deep after shorter birds, 3. Failure to check down on a retired gun with longer birds in the field, 4. Returning to old falls on tight water marks, 5. Failure to get in the water on blinds, 6. Failure to cast off points, 7. Dog unable to “read” blinds and navigate slots, 8. Steadiness issues, and 9. Poor blinds because of faults such as loopy sits. That’s a pretty good list and it describes exactly the needs that Rick chose to address with his drills. Overall, he has 4 marking drills, 3 blind drills and 3 problem solving topics. The first marking drill is the Y drill. We have published that exercise here in Retrievers ONLINE but Rick shows good footage on some challenging grounds. One of his examples is very demanding as it involves water cheating marks. He then illustrates a checkdown drill. He makes no qualms in identifying that he got this drill from the pages of Retrievers ONLINE and he runs it exactly as we have recommended. It’s nice to see it in good video footage. This is followed by the opposite – a punch bird drill. His design is clean and effective. He even shows one dog that has a problem with it and how he dealt with it. I have a similar albeit more involved Punch bird drill that I hadn’t published before so I have included it in this issue. Finally, Rick illustrates what he calls a crazy quad. This is similar to an ABCD drill on water or what Lardy calls a Stupid Water quad. The DVD moves onto the handling drills, starting with a ‘cast into the water’ drill. This is similar to the original drill developed by Rex Carr but Rick shows some nice details about building the original blind with different dogs. He then illustrates a ‘casting off a point’ procedure that will help many of you. Finally, he shows what he calls a keyhole drill. Basically, this is a 3-peat blind, like we have discussed often in ONLINE. Using two parameters (targets) such as hay bales, Rick shows you how to run this and why it helps. The final section shows a good technique for addressing loopy sits. Bird Boy Blinds have to be seen to understand and you will see them well illustrated in the DVD, Finally, Rick illustrates a 180 degree triple drill which he uses for dogs with steadiness issues. It requires a dog to keep sitting even with 180 degree marks. While I am not an advocate of dogs never moving on the line to swing to wide birds, Rick explains how “in training” this is a worthwhile pursuit. I have since tried it while training and I like it!! The production, filming, editing, sound and organization of this DVD is improved over the earliest Fowl Dawgs; it is very well done. 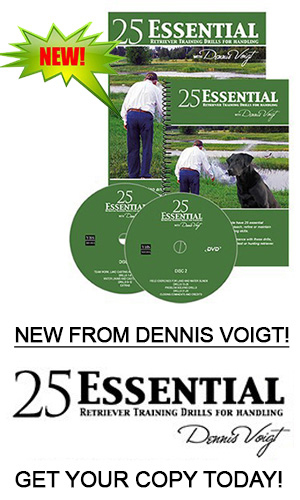 At only $24.95 (plus $7 S&H), this is an extremely good value training DVD. I give this DVD and the Drills selected 5 stars.